Dai Nippon Printing (DNP) has announced the development of an information delivery terminal for mobile phones equipped with FeliCa. This so-called Electric Wave Poster system is composed of their ‘PetitPorta’ reader unit and a dedicated URL management server which is configured to deliver information related to the POP (point of purchasing advertisement) to RFID enabled handsets. The total number of accesses for each location can be tracked and, if desired, a membership prompt is also possible in order to collect user information for loyalty programs or future marketing campaigns. 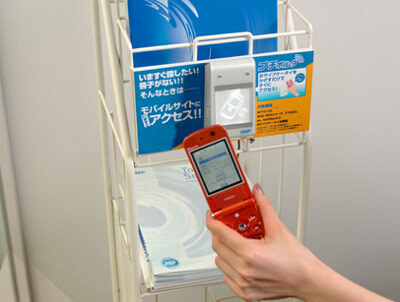 An ‘Interactive free paper rack’ test case was conducted, in cooperation with JL Ltd., using this system which synchronized handsets with free newspaper stands providing information such as maps and coupons for print advertisers. It can also act as a membership campaign registration platform or event ticket and notification system. According to the company, compatible models include all of DoCoMo’s 3G FOMA 902i series, 903i series and 703i models as well as all au and SoftBank (as of March, 2007). DNP plans to offer the readers and dedicated server as an ASP service. Apparently five terminals and the URL management server will cost 198,000 yen (excluding tax) per week. DNP expects sales of 300 million yen over the next five years with sales set to begin in August 2007. Via: Nikkei.